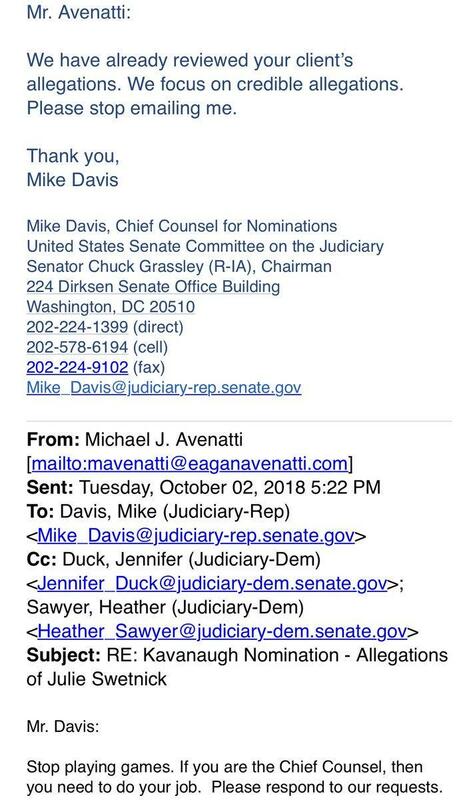 Michael Avenatti - or his client, Kavanaugh accuser Julie Swetnick - is having a tough time being taken seriously. On Monday, Avenatti complained Monday on Twitter that his client still had not heard from FBI agents: "It is outrageous that my client has not been contacted by the FBI because Trump is instructing them not to," Avenatti wrote. "He is trying to ram through a nomination by purposely preventing the truth from being known." The back and forth escalated as Swetnick’s claims have increasingly come under fire as her own credibility has been undermined by both recent interviews and her own past actions. So much so, in fact, that Louisiana Republican Sen. Bill Cassidy on Tuesday recommended an FBI investigation into Swetnick for making false statements about Judge Kavanaugh. The threat of a probe into his own client did not daunt the pop lawyer, who on Wednesday morning tweeted that "we still have yet to hear anything from the FBI despite a new witness coming forward & submitting a declaration last night. We now have multiple witnesses that support the allegations and they are all prepared to be interviewed by the FBI. Trump’s “investigation” is a scam." And, in keeping with his "shock" approach to the practice of law, moments ago Avenatti released a sworn, redacted statement with from yet another witness claiming to have seen Brett Kavanaugh and his friend Mark Judge "drink excessively and be overly aggressive and verbally abusive toward girls." In the statement, the unnamed accuser said she met both men in 1980 at beach week in Ocean City, Md, where she witnessed conduct that included "inappropriate physical contact with girls of a sexual nature." The witness also reportedly saw Kavanaugh and others "spike" "punch" at house parties with Quaaludes and/or grain alcohol during the period 1981-82. With little to lose - considering the FBI investigation into Kavanaugh may conclude as soon as today - the latest Avenatti client said that she knows the other Kavanaugh accusers, Christine Blasey Ford and Julie Swetnick, and believes they are truthful, and added that she was aware of other inappropriate conduct and other witnesses. Meanwhile Avenatti, desperate to be taken seriously, said that his witness is "prepared to meet with the FBI today and disclose multiple facts and witnesses." The only question is whether the FBI is prepared to meet with her.